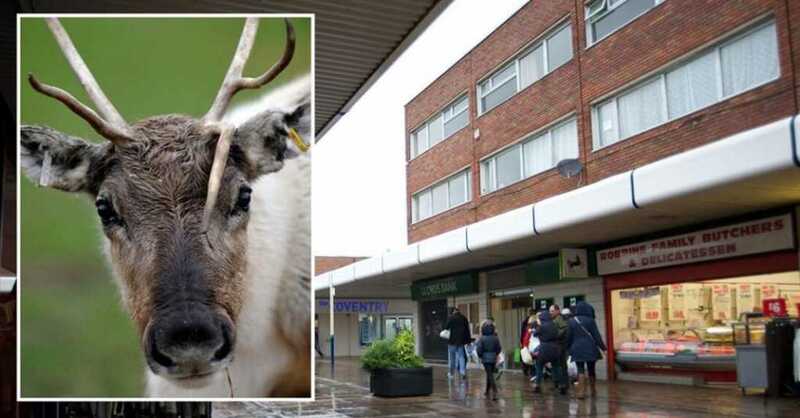 Chelmsley Wood Shopping Centre has axed a Christmas reindeer event – due to be held on 8th December – amid animal welfare concerns. The centre has scrapped the reindeer visit following a flurry of complaints. The cancellation comes just days after undercover footage of alleged animal abuse at another centre emerged. Secret recordings were made by the charity Animal Aid at The Reindeer Centre, near Ashford in Kent, and showed reindeer allegedly being kicked and screamed at by workers. The footage prompted an outcry and the cancellation of dozens of festive reindeer events across the UK. Now the shopping centre, in Maple Walk, has announced the reindeer visit would no longer be going ahead – leaving them out of pocket. It’s not the first animal-based event to be scrapped by the centre, who were forced to cancel a petting zoo at Easter following a number of complaints. In a statement on their Facebook page, a Chelmsley Wood Shopping Centre spokeswoman wrote: “We regret to inform you that due to the high number of grievances we have received against the reindeer visiting the centre, we have made the decision to cancel the event. “Although the reindeer would have been well looked after and would have been in a large shop unit away from crowds and noise, we appreciate that this may still cause upset to some people. “The reindeer were booked through a small charity, whose sole aim is to enrich and enhance the lives of youngsters and their families living with illness, disability or lack of opportunity. “We are still going to honour our donation to them, as they rely entirely on donations to run the charity. “Chelmsley Wood Shopping Centre would like to remind all our customers that no profit would have been made from this event whatsoever, it was purely booked to provide free Christmas entertainment for families. Another wrote: “Shoving an animal into a transport crate, causing untold distress and misery, so a few kids can look at them for hours isn’t right. And another woman added: “Well done for cancelling it. There are many other ways to entertain your customers than using live creatures that do not suit that sort of environment. Good move Chelmsley Wood, nice to see a company listening to views and considering the animal welfare angle. A representative for Chelmsley Wood Shopping Centre told BirminghamLive more than 100 complaints had been received about the event, leaving them with no option but to cancel. Cheryl Damms, Marketing and Events Co-ordinator at the shopping centre, said: “We had the reindeer here last year and there were no issues at all, but this year we received over 100 complaints. “People were concerned about the welfare and safety of the animals. “I am very disappointed as it’s a no-win situation – now we’ve received a high number of complaints about the fact the event has been cancelled. “The reindeer would have been at the centre for a number of hours inside an empty shop unit, away from the noise. “They would have been looked after and small groups would have been allowed in at a time to pet them. “We were due to have a petting zoo last Easter, which also had to be cancelled due to complaints. The cancellation comes just days after eight live reindeer events were scrapped in the run-up to Christmas – after an undercover investigation showed a worker kicking one of the animals. Animal Aid used hidden cameras at The Reindeer Centre near Ashford, Kent, which it said showed ‘shocking’ abuse. The animal rights group said eight businesses have now vetoed using live reindeer in their festive events. A spokeswoman for Animal Aid said “captive reindeer events” were “simply not in the best interests of the reindeer, who should be living wild lives”. However, Stephen Swinnerton, owner of Blithbury Reindeer Lodge in Rugeley, Staffordshire, warned boycotting reindeer events could prove fatal. Mr Swinnerton added: “Predators in Scandinavia are becoming a major issue, so we have been asked to help to protect 10 different bloodlines of reindeer by the Samis in Scandinavia, which would die out if they were not brought here. A spokeswoman for the RSPCA said: “Like many people, the RSPCA loves Christmas and it is always great to see people enjoying the festivities, and we understand that for many people, especially youngsters, seeing a ‘real’ reindeer adds to the magic. “But what some people don’t realise is that reindeer require lots of specialist care. “They are not easy to look after properly and they are susceptible to stress and a host of health and welfare problems when kept in permanent captivity in the UK, particularly in more southern areas. “These animals are semi-wild that are highly adapted to the arctic environment. “They have very different needs to deer that are native to the UK and it is much more difficult to meet their needs, particularly when kept by non-specialists in small groups for use at festive events. “This means having them in a busy environment, surrounded by crowds, noise and lights during a festive event makes it even more difficult. “In the wild, reindeer are prey animals so they naturally hide their illnesses. “So many owners may not realise they are poorly or able to spot the problems until it is too late.